Review posted March 1, 2016. Candlewick Press, 2015. 90 pages. The Princess in Black is back! This time it’s her birthday. Twelve princesses and their pets have come for the party, which Princess Magnolia wants to be perfect. But every time Princess Magnolia gets ready to open presents, the monster alarm goes off! 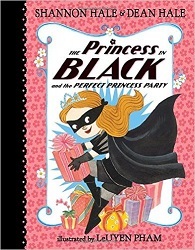 The Princess in Black must fight the monsters and send them back to Monster Land. But Princess Magnolia doesn’t want her guests to know that she is really the Princess in Black. Not even the ever-so-good-at-hiding Princess Sneezewort. Princess Magnolia keeps coming up with different activities – hide-and-go-seek, races, a labyrinth, to cover up for her absences fighting monsters. My only disappointment? I was hoping to see Duff the Goat Boy investigate his own monster-fighting powers. But there will be more books. There is time for that. Like the first book, this one will span a wide age range. An easy reader, it will booktalk well with the younger grades of elementary school. Boys and girls both enjoy these books. Yes, Magnolia’s a princess, but she’s also a superhero! My two two-year-old nieces will enjoy it because there are plenty of pictures. And plenty of princesses as well. This is a wonderful series with plenty of imaginative touches. There is repetition so helpful for beginning readers and simple language, but humorous twists which reward reading. The party keeps on getting interrupted, and readers will enjoy the way things slightly change each time. Book Three is out -- I was going to post its review when I realized I hadn't posted this one yet! All are wonderful and bring something new to the party!